Is Iran Pres. Rouhani trying to Rehabilitate Khatami & the Reformers? Iran’s president has broken a long-standing taboo by publicly defending a reformist predecessor, but his remarks were met with a muted response. The crowd in the central Iranian city of Yazd cheered wildly at the mention of their native son. But Iran’s state-run IRINN television, well aware of a long-standing media ban against mentioning Khatami’s name, quickly cut the volume. Social media also showed banners of Khatami and Rohani being held up by the crowd during the speech, but they could not be seen on the live broadcast. Scott Lucas, an Iran specialist at Birmingham University in Britain and editor of the EA World View website, suggests Rohani was emboldened by February elections that strengthened the hand of relative moderates and reformists. Ghanem Nuseibeh, founder of the London-based political-risk-analysis group Cornerstone Global Associates, says Rohani took a calculated risk that could put him on a collision course with hard-liners. Yet Iran’s news media were largely silent in response to the development. The hard-line daily Keyhan and conservative dailies Resalat and Vatan-e Emruz failed to note Rohani’s mention of Khatami — or that Mohammad Reza Aref, a vice president under Khatami and the reformists’ most prominent candidate in the recent parliamentary vote, had accompanied Rohani to Yazd. Major reformist newspapers such as Sharq and Etemad also failed to mention the former president, although they highlighted Rohani’s remarks on the “dialogue among civilizations” — a phrase coined by Khatami. The hard-line daily Javan stood out as an exception by publishing a large photo of Rohani on its front page and mentioning Khatami. The government news agency IRNA also reported Rohani’s comments on Khatami on its website. The majority of reformist and moderate outlets carried Rohani’s remarks, while somewhat surprisingly Rohani’s own website in English did not put up his speech. Iranian media are banned from publishing the name or images of Khatami, who was president from 1997 to 2005, on account of his support for the defeated reformist candidates in the disputed 2009 reelection of Mahmud Ahmadinejad. Rohani said it was a “complete lie” that the National Security Council could ban the publication of Khatami’s photo. “The National Security Council has no such directive and if anyone claims otherwise, he is breaking the law,” he said. 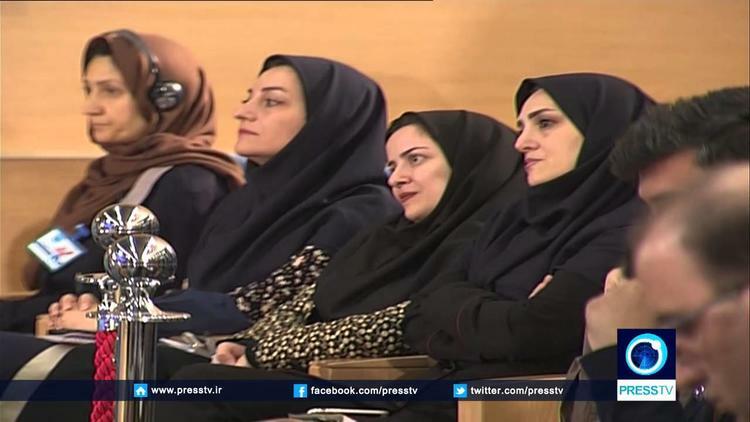 Iran’s judiciary promptly reacted to Rohani’s comments, however, and said the ban was still in place. The media blackout is apparently part of an effort by hard-liners to silence Khatami, who remains one of Iran’s most popular politicians. Despite the media ban, Khatami managed to publish a five-minute video on social media before the recent elections that are credited with swinging the balance in favor of reformists and relative moderates aligned with Rohani. In a statement published on Khatami’s website on March 8, the former president urged fewer restrictions in the Islamic republic. “We must all try so that the reputation of the system is not damaged and to have an open atmosphere for everyone’s participation, to remove restrictions and limitations,” he said. His remarks came after the opposition website Kaleme on March 5 reported that security agents had not allowed Khatami to leave his house to attend the wedding of the daughter of Mir Hossein Musavi, a prominent leader of the opposition Green Movement who has been under house arrest since 2011.